At this weekend's Minecon convention, Mojang unveiled the first trailer for the upcoming Telltale Games video game Minecraft Story Mode, while announcing that actors Patton Oswalt, Brian Posehn, Ashley Johnson, Scott Porter, Martha Plimpton, Dave Fennoy, Corey Feldman, Billy West and Paul Reubens will voice roles in the upcoming game. Minecraft: Story Mode will be an all-new narrative-driven, episodic game series, developed by Telltale in collaboration with Mojang and members of the Minecraft community. Set in the world of Minecraft, the game series will introduce new characters and familiar themes, but will be an entirely original Minecraft experience inspired by the game that continues to inspire a generation. Players will control protagonist Jesse throughout the season, as portrayed by actor Patton Oswalt. Jesse and his group of friends revere the legendary Order of the Stone; four adventurers who slayed an Ender Dragon. The Order are the very best at what they do: Warrior, Redstone Engineer, Griefer, and Architect. While at EnderCon, Jesse and his friends discover that something is wrong... something dreadful. Terror is unleashed, and they must set out on a journey to find The Order of the Stone if they are to save their world from oblivion. Here's what Telltle Games' Kevin Bruner had to say in a statement. "We've worked closely with the amazing team at Mojang to ensure this story is a natural fit for the Minecraft world fans already know and love. As Jesse, players will steer their own path through a tale of adventure and survival; all brought to life by an all-star cast. Through Telltale's choice-based gameplay and a story spanning from the Nether to the Farlands, the End, and beyond, we can't wait for fans to experience this new take on the beloved world of Minecraft." Owen Hill, Chief Word Officer at Mojang, had this to say in his statement. "The interactive storytellers at Telltale are giving players the chance to explore their own unique interpretation of the Minecraft universe. They've crafted a story that follows the logic of Minecraft, but still manages to feel original. It's actually pretty funny too. And the pig is adorable. We're super excited about players digging deeper into the world of Minecraft: Story Mode later this year." Minecraft: Story Mode will be a standalone product, separate from the core Minecraft game, and will be available to download later this year on PC/Mac, PlayStation 4, PlayStation 3, Xbox One, Xbox 360, and compatible iOS and Android-based devices. 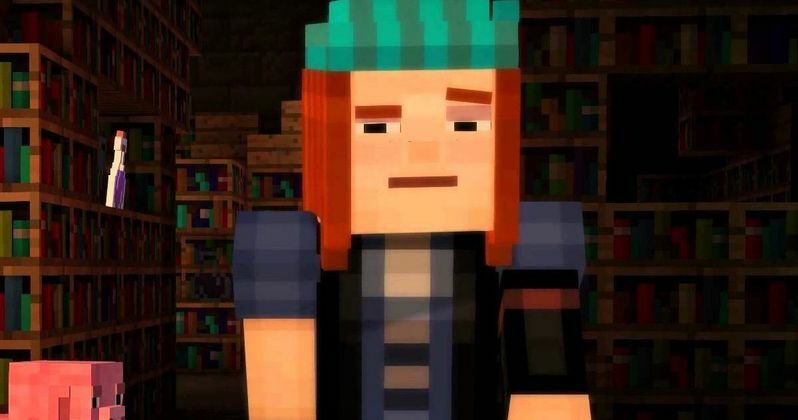 Mojang revealed that more voice cast members will be announced for this video game, so stay tuned for that announcement, and hopefully we'll learn who Corey Feldman and the other cast members are playing. In the meantime, check out the trailer below.